Absolutely fabulous! : How many brooches is too many? How many brooches is too many? How many brooches is too many? According to one popular American fashion magazine, it seems one cannot wear too many brooches, even pinned on all at the same time. 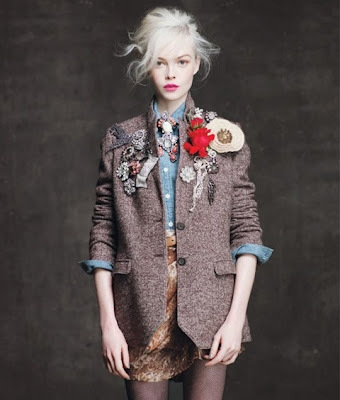 Wearing a large number of brooches makes a statement. The style may not be to everyone's taste, but it certainly will get the wearer noticed. 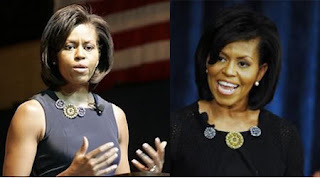 Sometimes multiple small brooches can have as much, but more subtle, visual impact, as one large, over the top brooch. Although some may say brooches come and go, it is my personal opinion that they are one of the most classic and chic ideas in jewelry. Wearing two brooches can be very chic and just right, when one isn't quite enough and three are a bit too much. 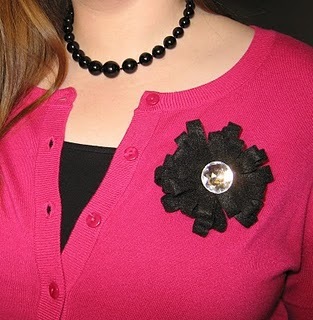 I'm especially enamored of the look of wearing two brooches that are an exact match except as to color. With their timeless appeal and feminine elegance, brooches instantly dress up any outfit for a very put together appearance. How many brooches is too many? You decide, it´s your call!